First off … love everyone regardless of their productivity. Just because they are not motivated to build this business right now, does not mean that they aren’t valuable people. Who knows, maybe the timing will get better and one day it will dawn on them that they’ve got to get on with building their own residual fortune. Or frankly, maybe they never will. But one thing is for sure – you always want every person to have a happy feeling about their experience with you. Why? Because you want them saying good things about you rather than spreading bad vibes. Too often, networkers burn bridges with their unproductive recruits, and that bad blood tends to poison everyone else around town and people are told not to do business with you. I have had hundreds of people go dormant, only to come alive later down the road and become great producers or team builders. But if I made them feel guilty about their lack of production early on, they would have never called me or taken my call later. So we should always kill everyone with kindness, and treat them how you’d want to be treated should you ever decide not to build your business. Let’s turn to what you can do NOW with people on your team who aren’t working the business, and still leverage them to build your business (and theirs). Always remember that a recruit is a doorway to hundreds of people you don’t know. 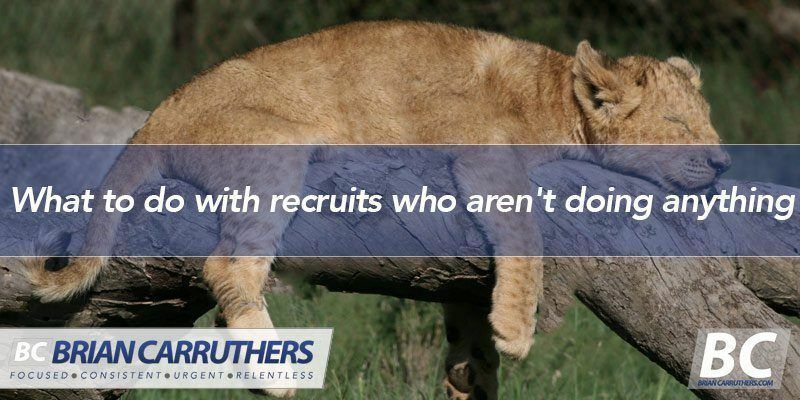 Even if your recruit isn’t ever going to call them, this doesn’t mean you can’t! Look, you want new recruits on your team, right? If you want a 10,000 person downline team, 99% of those people will need to come from other people’s contacts. 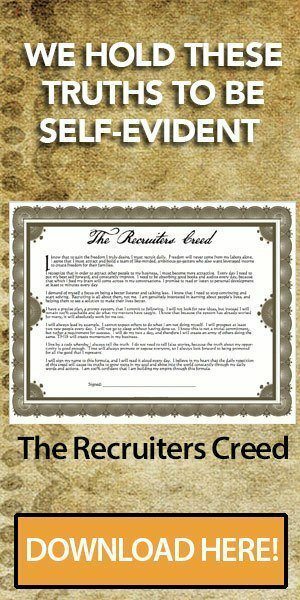 If you recruit people yourself, you’d be sticking them down in your legs somewhere anyway. So it doesn’t matter where the recruits come from, as long as they are joining your team. You just want more people. You can rely only on talking to complete strangers out and about … or you can make others people’s warm markets your own! How? Get referrals! Convince your inactive team members to give you the phone numbers for the sharpest people on their list. What if you get 10 contacts from each? Who would you rather talk to, complete strangers whom you have no idea of their caliber, or 10 people your associate can vouch for them being of good quality and drive? I’d much rather make a call to someone where I can drop their friend’s name and have something in common right off the bat. And I can also tailor my conversation based on what my associate told me about them. This makes for such an easier, warmer conversation. You will find that you’re met with far fewer flat out rejections this way. Usually if they aren’t interested, they will politely let you down easy because of the respect they have for their relationship with the referrer. You may not use the exact words above, but let this serve as the framework for the call. Your goal is to compliment them, make the referring friend look good, and invite them to a presentation of some sort. It works like a charm. What if you got the Top 10 list from one downline person a day and called them? Can you see how you will never run out of prospects? The calls will become the easiest ones you’ve ever made after you have done 5-10 of these. You’ll be so smooth and you’ll enjoy it because almost every prospect will take the compliment/flattery and have a nice conversation with you. You will actually look forward to more of these prospecting calls. PS – If you haven’t downloaded my FREE eBook everyone is BUZZING about, “The 2-a-Day Phenomenon,” download it now!